There are 88 Assisted Living Facilities in the New Berlin area, with 6 in New Berlin and 82 nearby. The average cost of assisted living in New Berlin is $3,930 per month. This is higher than the national median of $3,346. Cheaper nearby regions include Hales Corners with an average starting cost of $3,700. To help you with your search, browse the 291 reviews below for assisted living facilities in New Berlin. On average, consumers rate assisted living in New Berlin 3.8 out of 5 stars. Better rated regions include Hales Corners with an average rating of 4.3 out of 5 stars. Caring.com has helped thousands of families find high-quality senior care. To speak with one of our Family Advisors about assisted living options and costs in New Berlin, call (855) 863-8283. New Berlin, WI, is a Milwaukee suburb that ranks 11th on Money’s Best Places to Live for 2017. Approximately 8.7 percent of the city’s population is between the ages of 65 and 74 — higher than the state average of 7.7 percent for the same age group. This senior population has six assisted living facilities in New Berlin from which to choose, with 51 facilities located in surrounding areas like Greenfield, Wauwatosa and West Allis. 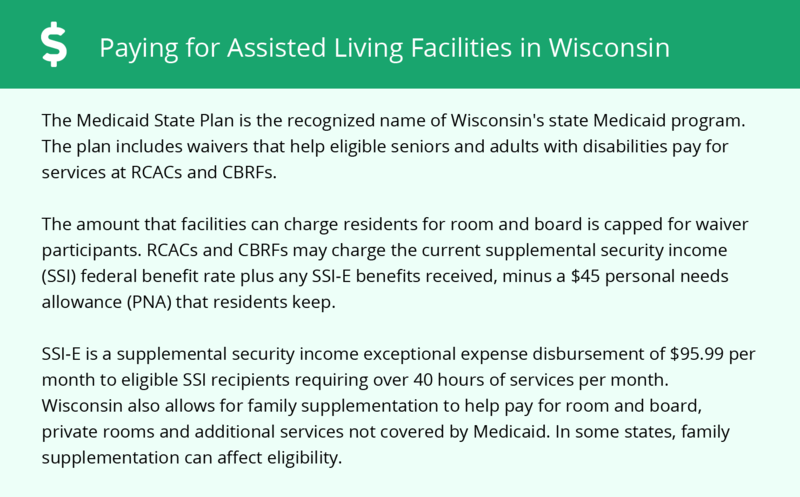 In New Berlin and the rest of Wisconsin, assisted living facilities are licensed by the Wisconsin Department of Health’s Bureau of Assisted Living. Licensing is based on facility size and whether residents are ambulatory, semi-ambulatory or non-ambulatory. There are plenty of enriching attractions in New Berlin for seniors to enjoy. Assisted living communities may offer supervised trips to places like Marcus Theatre, where seniors get discounted admission on Fridays. The city also hosts fun events throughout the year, such as art festivals and farmer’s markets. Seniors can affordably travel the New Berlin area via public transportation. The city is served by the Milwaukee County Transit System, which offers discounted fares for seniors age 65 and older. New Berlin is one of Wisconsin’s safest cities for seniors, with a violent crime rate of 23.7, which is substantially lower than the Milwaukee average of 91.2. Property crime in New Berlin is also lower at 27.6, as compared to Milwaukee’s 61.6 rating. Seniors can breathe easy in New Berlin because the city has an air quality rating of 73 out of 100. The U.S. on average ranks lower at 58. New Berlin experiences cold winters, with January lows reaching 13 degrees. Sperling’s Comfort Index rates New Berlin 38 out of 100; the city only has 188 sunny days per year on average, while the U.S. has an estimated 205 sunny days. The cost of living in New Berlin is rated 109.5, which is slightly higher than the U.S. average of 100. Seniors may find the higher cost reflected in assisted living monthly expenses, groceries and transportation. Assisted Living costs in New Berlin start around $3,930 per month on average, while the nationwide average cost of assisted living is $4,000 per month, according to the latest figures from Genworth’s Cost of Care Survey. It’s important to note that assisted living rates in New Berlin and the surrounding suburbs can vary widely based on factors such as location, the level of care needed, apartment size and the types of amenities offered at each community. 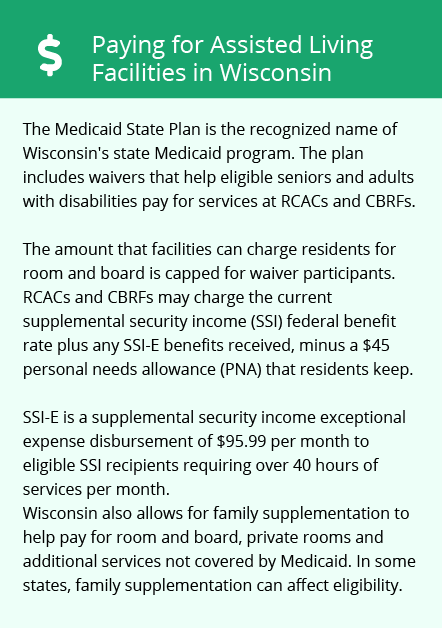 In Wisconsin, Medicaid covers the cost of assisted living services in facilities with 20 or fewer beds. New Berlin seniors may also qualify for an assisted living waiver to help reduce the monthly costs of assisted living. Another financial assistance program seniors may be eligible for is the Supplemental Security Income Exceptional Expense (SSI-E) program, which also helps cover assisted living expenses. New Berlin and the surrounding area are home to numerous government agencies and non-profit organizations offering help for seniors searching for or currently residing in an assisted living community. These organizations can also provide assistance in a number of other eldercare services such as geriatric care management, elder law advice, estate planning, finding home care and health and wellness programs. To see a list of free assisted living resources in New Berlin, please visit our Assisted Living in Wisconsin page. New Berlin-area assisted living communities must adhere to the comprehensive set of state laws and regulations that all assisted living communities in Wisconsin are required to follow. Visit our Assisted Living in Wisconsin page for more information about these laws.